Fancy taking a spin down in the likes of Monte Carlo in a two-seater drop that costs just £13,500?! You’re not dreaming. The new Smart ForTwo Cabrio is a bundle of joy that somehow merges together the best principles of a city car and a cabriolet to surprisingly good effect. It shouldn’t work – but it does. It’s a car for those who’ll be spending a lot of time in the city, and who want to make a bit of a statement. It’s fun, cool to look at, easy to drive – and unashamedly different. OSV takes a closer look at what it’s all about with our 2017 Smart ForTwo Cabrio review. The Smart ForTwo is at home in the city, where it breezes through traffic, ducks and dives around corners, and slots into parking spots with ease. It’s a pint-sized car that’s indeed made for urban jungles, with the brand tweaking its suspension and chassis so that it’s even better in what can often be an unforgiving place for bigger cars. The light steering helps you negotiate otherwise tricky turns – but there are a few caveats. Out of the city, the car is less surefooted. On the motorway, it will struggle and you might be in for a bit of a nervy experience. It gets a bit noisy out there too – less of a groan from the engine, and more of a cry for help! The brakes are a bit of an issue, too. When slowing down from higher speeds, the pedal feels overly soft, which can lead to some jerky braking action. Still, the brakes are perfectly smooth in slow-moving traffic. Hurrah for rush hour! The automatic transmission is brand new, and has been designed with the city in mind. It’s a bit jumpy on occasion, but most of the time it suits the car well. In terms of the engines, there are no diesels, which means you have to take your pick from a pair of 1.0-litre petrols. The biggest of the two returns 89bhp, which tells you all you need to know about this car – it’s hardly powerful. Still, this 900cc turbo engine is sprightly enough and certainly won’t be embarrassed in its natural habitat. It does 0-62 in 11.7 seconds, which is impressive. The smaller of the two petrols is a 70bhp variant; it does 0-62 in 15.5 seconds and makes a lot more noise. Worth overlooking. Especially if you do go to Monte Carlo and don’t want to embarrass yourself. 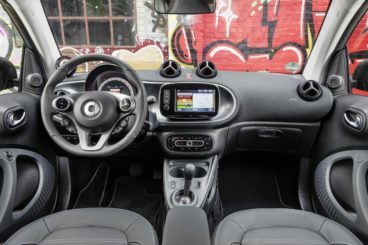 The best way to describe the Smart ForTwo Cabrio’s interior is “charming.” However, while it has a certain charm, the materials used are a bit of a letdown. The design and colours are funky enough and great to look at. This is a fabulous, fun-loving party animal that sports plenty of cute shapes, bubbly surfaces and lots of imagination on the part of the brand. And that just makes it all the more disappointing that they chose to include a number of hard plastics. A rev counter is optional, but like everything else, it feels so flimsy that one sharp turn could knock it off. Still, the seats are comfy. And if you pay a little bit more, you can get heated seats, too. Overall, the car feels well-built. In terms of how practical the car is, one look at it should be enough to tell you all you need to know. There are just two seats and barely any dimensions. That said, we must give kudos to the designers who have done what they can with the space available to make sure you’re reasonably comfortable. Storage space comes in the form of a few door bins, three cup-holders, and some storage nets. The fabric roof takes just 12 seconds to go up or down, while the boot measures 260-litres. That’s not bad at all when you consider how small the car is. Standard kit is decent across the range. All models get Bluetooth, climate control, 15” eight-spoke alloys, a multifunction steering wheel, and a 3.5” colour display screen on the dashboard. The Prime models add 15” five-spoke black alloys, a rev counter and heated black leather seats, while the Proxy model rounds the range off with sports pedals, 16” eight-spoke alloy and white and blue part-leather seats. If you’d prefer a red fabric roof instead of the standard black one, you can pay £115 to switch. 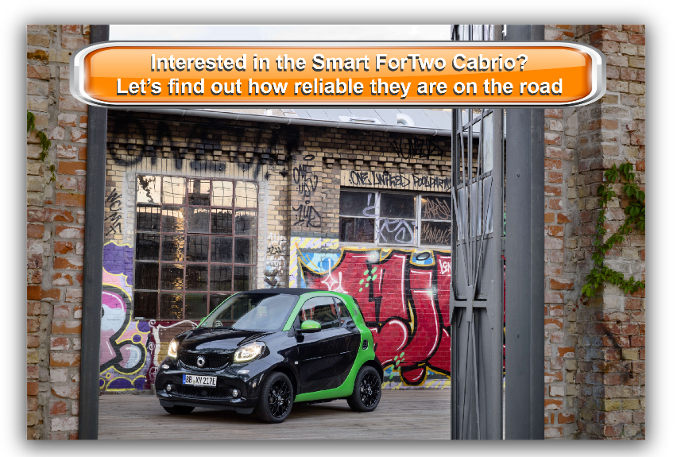 Is the Smart ForTwo Cabrio safe? It’s small enough to cause a few worries about how well it would protect you in the event of a crash, and it hasn’t yet been crash-tested by Euro NCAP. However, the coupe version scored 4/5 when it was put through its paces. Prices for the new car start out from £13,500 and rise to £22,345. If you prefer to lease, you can pick up a deal from £158 + VAT per month. For more information on our leasing deals, check out our page here. In terms of its running costs, the cheapest to run is – surprisingly – the more powerful of the two engines. While the tiny 1.0-litre petrol engine develops a modest 70bhp and returns 65mpg, the bigger 89bhp 900cc turbocharged unit is good for 67mpg. Of course, the differences are incremental and both engines emit less than 100g/km of CO2. However, while the smaller model occupies insurance group four, the 900cc model occupies groups 9 and 10. The Smart car was born for the city like fish are born for the sea. City car driving has hardly been this simple. We’d be stretching things if we called this the dinky two-seater practical, but its 260-litre boot is super impressive and dwarves rival as we’ll see below. Indeed, Smart has made the most of a lack of rear seats. If you only need space you and one passenger, this is a handy car. Both petrol models return over 65mpg. It’s not cheap, and you’ll need to fork out more than £22,000 for the top-spec model. Not exactly a shrinking violet, but you and the car will both be relieved to see your junction. Let’s see how the car fares against its rivals in the comparison section of our 2017 Smart ForTwo Cabrio review. 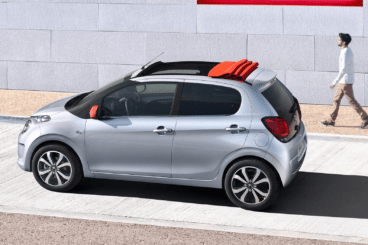 The new Citroen C1 Airscape is the range-topping trim of the C1 city car. It’s well-equipped, comes with a fabric roof, and looks funky fresh. On the road, not a lot has changed from last time. The underpinnings remain the same, which means comfy, soft suspension, light steering and the envious ability to breeze around the city without a care in the world. On the flipside, that extra soft suspension means there will be excess body roll in bends. Moreover, light steering is good most of the time in the city, but will hardly inspire confidence when you approach a corner too hastily. In terms of the engines, the Citroen C1 Airscape model is powered by a 1.2-litre petrol engine that can get you from a standstill to 62mph in 10.9 seconds. It’s refined, develops up to 81bhp, has a punch, and a good turn of pace. In terms of its running costs, it fares well, averaging 65.7mpg and emitting just 99g/km of CO2. Thanks to changes to the rules, the first year is tax-free, but after that you will need to pay £140 a year in road tax. Inside, the Citroen C1 Airscape is a bit of a disappointment. It looks cute and colourful, but in terms of quality? There isn’t a lot to say. A lot of the plastics feel cheap and don’t look built to last. That said, the Airscape trim has a few things going for it over the standard Citroen C1. For one thing, it gets a height-adjustable driver’s seat, which improves visibility and comfort, while insulation is also good. You also get the fabric roof which will make those morning commutes on boiling hot summer days so much more bearable! The dash is designed with younger buyers in mind, and there are plenty of personalisation and trim options available. It’s well-laid out and easy to use, too. Unlike the Smart ForTwo, the C1 Airscape gets rear seats – but they are cramped. Upfront, there is lots of room, but life isn’t easy in the rear. It’s not helped by back doors that don’t open very wide. Still, you get to choose between a three-door and a five-door model. The boot, meanwhile, measures 196-litres. That’s considerably smaller than the two-seater Smart car, so you might have to decide between extra seats and more boot space. 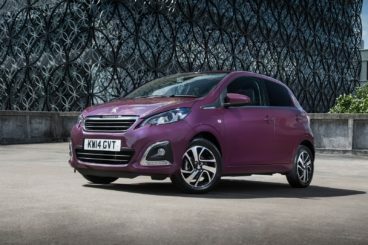 The new Peugeot 108 Hatchback is stylish and affordable, and the range-topping trim – which is the focus of this review – comes with a full-length folding roof. In terms of out and out fun, the new 108 doesn’t fare too well. It’s more stable and composed, but does feel better engineered than its predecessor. Light steering is the name of the game, and it makes for a tidy companion on congested city streets. This range-topping version gets the benefit of the more powerful of the two petrol engines. It’s powered by a 1.2-litre unit that feels fast at high speeds, and covers the 0-62 dash in 11.0 seconds flat. That’s par for the course in this class. The engine is sprightly, easy to drive and always feels agile. It also copes admirably on the big bad motorway. The engine doesn’t fare too badly where running costs are concerned either. It averages 65.7mpg economy, and emits less than 100g/km of CO2. This means the first year of ownership is tax-free, while each year thereafter you will be paying £140 in road tax. Insurance? It sits in group twelve out of 50. Inside, Peugeot has worked hard to make the new 108 Hatchback more comfortable than last time. They’ve succeeded, but there are still comfier rivals. However, it’s much improved. Insulation is also better, and the car feels a lot more grown-up than it used to. Does its dashboard have the same sense of fun as the Smart car, though? It does. There aren’t as many personalisation options, and it isn’t as funky. But colourfully patterned upholstery, a 7” touchscreen, a DAB radio and an overall simple design are highlights. In terms of how practical the Peugeot 108 Hatchback is, its one obvious advantage is that it’s got two extra seats. Four adults can sit in relative comfort, but how practical the car is will depend on whether you go for the three-door or five-door variant. Visibility is good, the driver’s seat and steering wheel offer lots of adjustabilities, while electric front windows and remote central locking come as standard. A glovebox is on the small size and can’t hold much more than a bottle of water, while the boot measures 196-litres – that’s a lot smaller than the Smart’s offering. If all you need are two seats and quite like the idea of a city car with a drop-down roof, the new Smart car is a fun-loving, quirky choice. Anyone who drives a Smart car stands out from the crowd, but this is far from a novelty vehicle. You’ll make those big saloon drivers jealous as you squeeze through gaps in traffic, you’ll have a ball in the summer when you can take your roof down and blast out your tunes on the way to work, and the best thing? 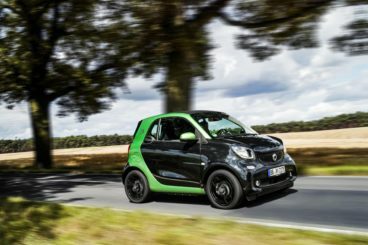 The new Smart ForTwo Cabrio has a 260-litre boot, which means you don’t lose out on the practicality front.